Shift the chain to the largest socket. 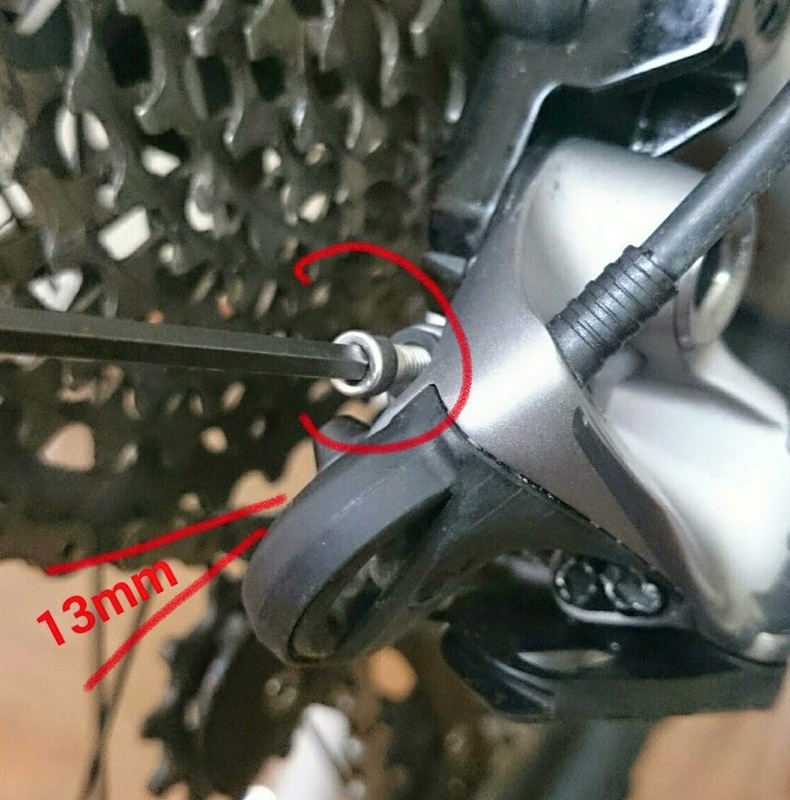 Refer to Photo 03 & 04, use a 3mm allen key to adjust the space between the pulley and socket to about 13mm. Too wide space will cause delay in shifting, whereas too near will cause harsh shifting. Play with the distance (12mm to 15mm) to identify the ideal space for your bike. If you are unsure, adjust to recommended 13mm spacing. Ensure the chain is on the largest socket. Adjust the L-limit screw (see photo 05) with 3mm allen key to align the pulley with the largest socket. I usually spin the crank with one hand and adjust the L-limit screw with another hand concurrently. Adjust the L-limit screw until you hear and see the chain run smoothly over the largest socket. Once that happen, the largest socket will be aligned with the pulley. The chain will fall out of the largest socket if the L-limit screw is over adjusted, or gear down to the lower socket if under adjusted. Shift the chain to the smallest socket. Adjust the H-limit screw (see photo 06) with 3mm allen key to align the pulley with the smallest socket. I usually spin the crank with one hand and adjust the H-limit screw with another hand concurrently. Adjust the H-limit screw until you hear and see the chain run smoothly over the smallest socket. Once that happen, the smallest socket will be aligned with the pulley. 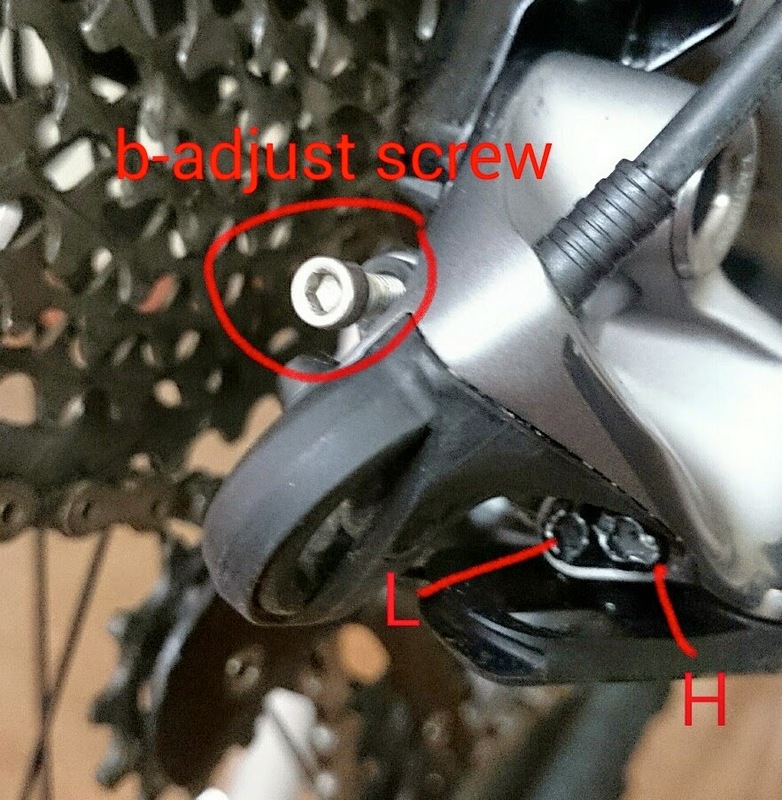 The chain will fall out of the smallest socket (between smallest socket and bike frame) if the H-limit screw is over adjusted, or gear up higher socket if under adjusted. Spin the crank and play with the rear shifter to see if the chain shift smoothly and precisely across all sockets. If there is any delay in up or down shift, fine tune it by rotating the barrel adjuster (see photo 07). 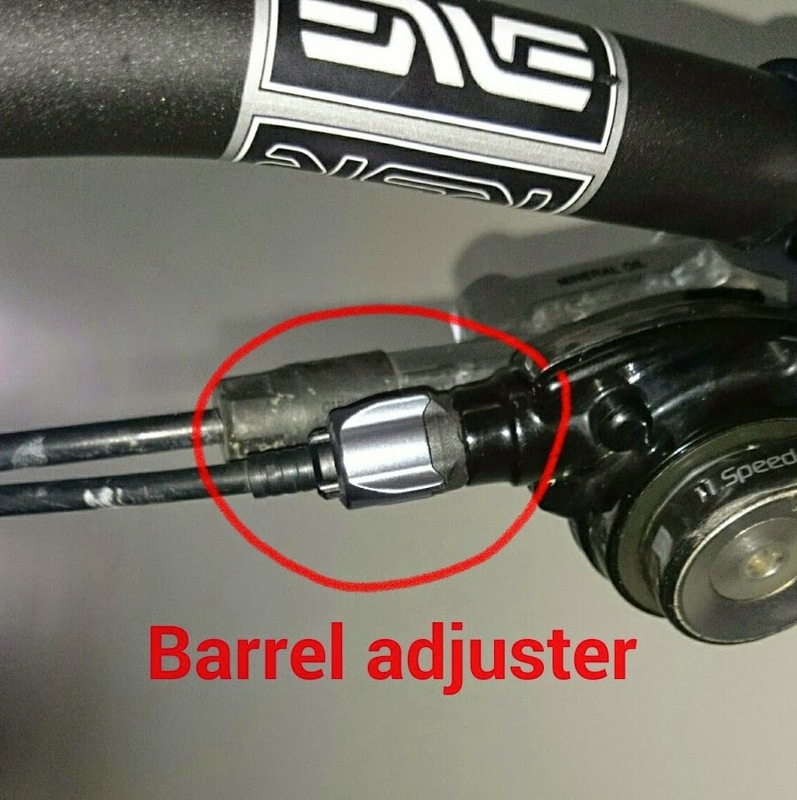 The barrel adjuster basically adjust the tension of the shifter cable. If you perform the above 4 adjustments correctly, the gear shift should be smooth and precise. If you still unable to get it done despite performing the above 4 steps, you may need to tighten or replace the shifter cable. Otherwise, the hanger or the derailleur cage may be twisted. Other possibility may include loose chain, test it with a chain gauge (seldom the case if you have set up properly in the first place). The above table illustrates the problems, possible causes and remedy actions (Source: SRAM Service Manual). Thanks, good to know the 13 mm gap is required. You are welcome. Glad it helps. The distance between the tips of largest cog and pulley. You may want to use vernier calliper to measure if you were unable to do it with ruler. Great article, and spot on for hardtails. But for dual suspension, particularly those with longer rear travel, it's best to remove air form the shock such that the shock lowers down to the % sag value the rider uses. ONLY then, do they follow these instructions. My bad, error amended. Thanks. did someone here notice a weird feel while pedaling on the 12T and 14T cogs? What kind of weird feel? like the contact with the chain and cogs is not perfect, its like i am feeling the bite on the cogs while pedaling. everything is new i also ran an XX1 chain. I check my XTR BB92 and I cant find any problem. I ran a raceface 32T NW on a XT 2X crankset. "H" = High gear or "Hardest Gear" or smallest cog. Actually, I think the photos are still wrong. The outside screw adjusts low. Inside adjusts high. Yes they are. Photo 0 is incorrect and confusing since L and H are the other way around. In photo 05 you are correctly adjusting the L screw (the outer one) when you adjust the largest sprocket. Photo 5 caption incorrectly refers to H screw. So does anybody have any idea which is the L screw and which is the H?